Jacobsen turf equipment has been chosen to maintain the course at Levi Golf Club, the most northern golf course in Finland, and the third most northern in the world. The equipment is manufactured by Jacobsen and supplied by local dealer, J Trading. The course, which is part of Levi Ski Resort, opens at the beginning of June and closes at the end of September. 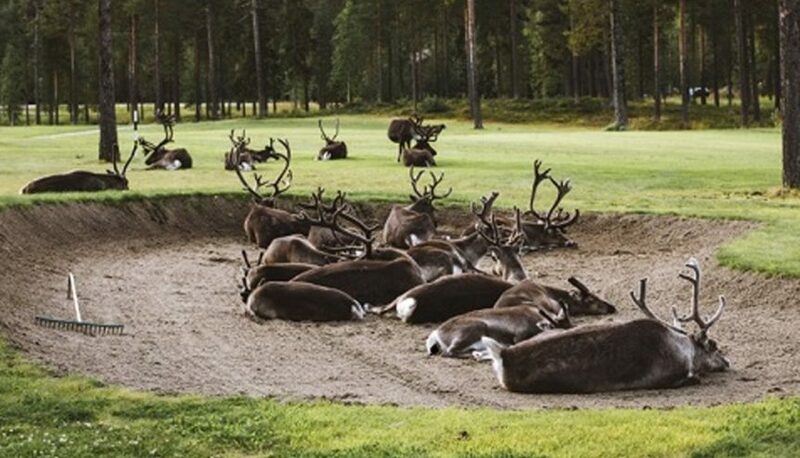 With such a short season, head greenkeeper Ilkka Kutvonen describes what it is like to maintain the course located in Lapland. “In winter, the sun doesn’t rise, and in summer, the sun doesn’t set. Whilst the course is closed for most of the year due to snow, when we open in June, the rate of grass growth is phenomenal. Everything moves very quickly in summer, and our team of 10 greenkeepers must work very hard to perform 12-months’ worth of maintenance in just four months. “When it comes to machinery, it is vital that the mowers are reliable and able to cope well in all kinds of weather. With such a short golfing season, we need equipment to produce a fantastic finish every single day. It is for these reasons that we use Jacobsen on the course. My favourite machine is the Jacobsen Eclipse 322; the technology is the future of greenkeeping, and some of our greens are 500m2, so the speed of work is also a big advantage. Levi Golf Club is an 18-hole course, the first nine holes opening in 2006, and the second nine holes following in 2009. The course is situated in an area of exceptional natural beauty and is built around Lake Taalojärvi and the surrounding fells.